The most famous thing Neil Armstrong left on the moon 35 years ago is a footprint, a boot-shaped depression in the gray moondust. Millions of people have seen pictures of it, and one day, years from now, lunar tourists will flock to the Sea of Tranquility to see it in person. Will anyone notice, 100 feet away, something else Armstrong left behind? Ringed by footprints, sitting in the moondust, lies a 2-foot wide panel studded with 100 mirrors pointing at Earth: the "lunar laser ranging retroreflector array." Apollo 11 astronauts Buzz Aldrin and Neil Armstrong put it there on July 21, 1969, about an hour before the end of their final moonwalk. Thirty-five years later, it's the only Apollo science experiment still running. 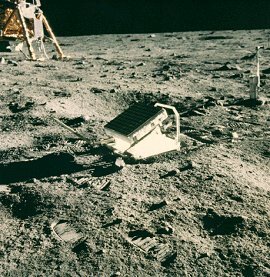 University of Maryland physics professor Carroll Alley was the project's principal investigator during the Apollo years, and he follows its progress today. "Using these mirrors," explains Alley, "we can 'ping' the moon with laser pulses and measure the Earth-moon distance very precisely. This is a wonderful way to learn about the moon's orbit and to test theories of gravity." Here's how it works: A laser pulse shoots out of a telescope on Earth, crosses the Earth-moon divide, and hits the array. Because the mirrors are "corner-cube reflectors," they send the pulse straight back where it came from. "It's like hitting a ball into the corner of a squash court," explains Alley. Back on Earth, telescopes intercept the returning pulse--"usually just a single photon," he marvels. The round-trip travel time pinpoints the moon's distance with staggering precision: better than a few centimeters out of 385,000 km, typically. Targeting the mirrors and catching their faint reflections is a challenge, but astronomers have been doing it for 35 years. 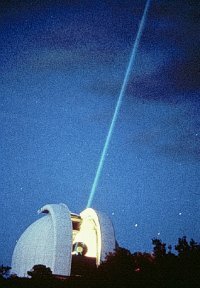 A key observing site is the McDonald Observatory in Texas where a 0.7 meter telescope regularly pings reflectors in the Sea of Tranquility (Apollo 11), at Fra Mauro (Apollo 14) and Hadley Rille (Apollo 15), and, sometimes, in the Sea of Serenity. There's a set of mirrors there onboard the parked Soviet Lunokhud 2 moon rover--maybe the coolest-looking robot ever built. (1) The moon is spiraling away from Earth at a rate of 3.8 cm per year. Why? Earth's ocean tides are responsible. (2) The moon probably has a liquid core. (3) The universal force of gravity is very stable. Newton's gravitational constant G has changed less than 1 part in 100-billion since the laser experiments began. Physicists have also used the laser results to check Einstein's theory of gravity, the general theory of relativity. So far, so good: Einstein's equations predict the shape of the moon's orbit as well as laser ranging can measure it. But Einstein, constantly tested, isn't out of the woods yet. Some physicists (Alley is one of them) believe his general theory of relativity is flawed. If there is a flaw, lunar laser ranging might yet find it. NASA and the National Science Foundation are funding a new facility in New Mexico, the Apache Point Observatory Lunar Laser-ranging Operation or, appropriately, "APOLLO" for short. Using a 3.5-meter telescope with good atmospheric "seeing," researchers there will examine the moon's orbit with millimeter precision, 10 times better than before. "Who knows what they'll discover?" wonders Alley. More and better data could reveal strange fluctuations in gravity, amendments to Einstein, the "sloshing" of the moon's core. Time will tell ... and there's plenty of time. Lunar mirrors require no power source. They haven't been covered with moondust or pelted by meteoroids, as early Apollo planners feared. Lunar ranging should continue for decades, perhaps for centuries. Picture this: Tourists in the Sea of Tranquility, looking up at Earth. Half of the planet is dark, including New Mexico where a pinprick of light appears. A laser. Editor's Note: Among many early contributors to the the lunar laser ranging retroreflector array project, Prof. Alley credits Robert Henry Dicke, James Faller, Peter Bender, Douglas Currie and Bendix Corporation.